CELEBRATE LADY DEATH DAY & SHARE! « HERE’S WHAT’S HAPPENING NOW WITH LADY DEATH! We’re stoked to announce that NOW AND FOREVER that February 9 is officially “Lady Death Day”, where we celebrate the release of Lady Death #1! Bring your comics, merch and apparel around with you on Lady Death Day (February 9th), SNAP PICS AND POST THEM to social media with hashtag #LadyDeathDay to WIN PRIZES! If you don’t have comics, merch or apparel, you can print out and use this Lady Death cut-out instead! Just click on the image and save! 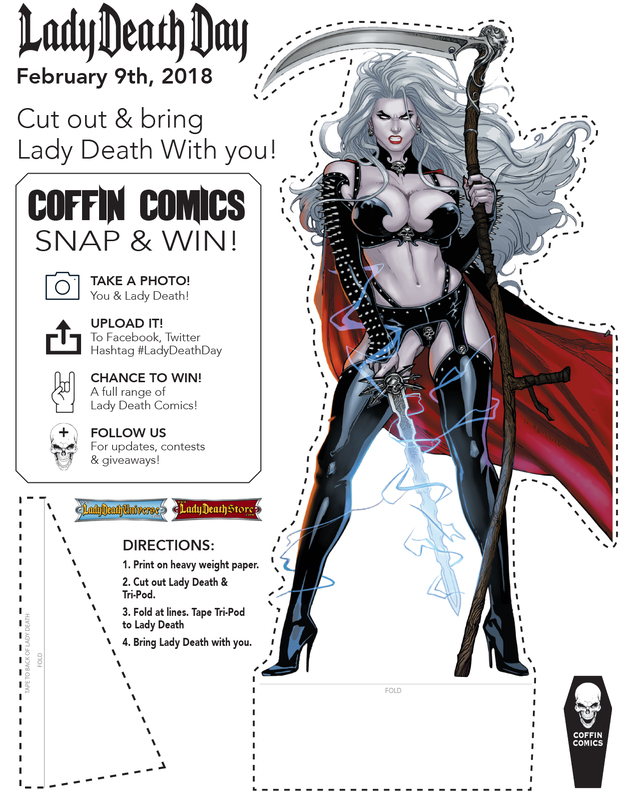 This entry was posted in News and tagged cut-out, lady death, lady death day. Bookmark the permalink. Both comments and trackbacks are currently closed.